By now, most people with even a passing interest in science will have heard about the Square Kilometre Array (SKA). 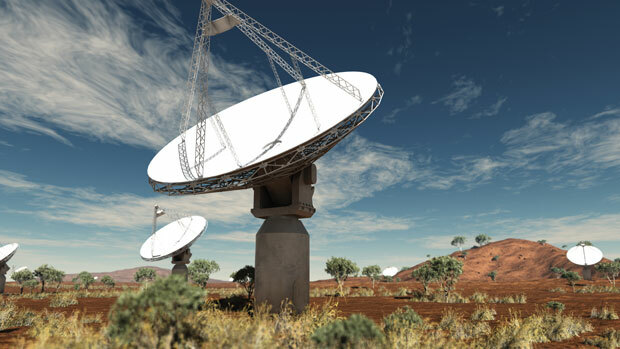 It is the world’s largest radio telescope, and will operate over sites in South Africa and Western Australia. But exactly what will this telescope do? And what are the scientific questions that it one day may be able to answer? The SKA will be 50 times more sensitive and 10 000 faster than the best radio telescopes we have today. It will have the capacity to produce images with resolution quality 50 times higher than the Hubble Space Telescope. The SKA’s greater sensitivity will expand the range of the observable universe and has the potential to answer profound questions in astrophysics, cosmology and fundamental physics. Modern radio telescopes are collections of antennae that are scattered over a large area. Using a technique called interferometry, they behave as a single dish, with a total collecting area of all the antennas combined — up to one square kilometre for the SKA. With this and other modern instruments, teams of astronomers will readily be able to see the universe in ever greater detail at all wavelengths of light. The SKA will detect hydrogen, the most abundant element in the universe. Neutral hydrogen is the basic building block for stars — stars form when hydrogen clouds collapse under their own gravity. Once galaxies form not all the hydrogen is in stars, and it is this remaining hydrogen that we see with radio telescopes. 1. Through SKA, we will be able to go back to when the first stars and black holes formed an era known as the “Dark Ages”. It will provide a time lapse of the universe allowing astronomers to learn about the mechanisms by which the first structures were created. 2. The SKA will also directly probe Einstein’s theory of general relativity using highly magnetised and rapidly spinning neutron stars known as pulsars. These pulsars are cosmic lighthouses, emitting a pulse of radiation at very precise intervals. Due to the exact timing of the pulses, they can be used as cosmic clocks. By locating pulsars that are orbiting black holes and timing them, we can study general relativity in extreme gravity conditions as well as testing the predictions that general relativity makes about the black hole itself. General relativity also predicts the existence of gravitational waves — literally waves in the space-time continuum. By monitoring an array of these clocks with the SKA, we can try to detect disturbances caused by a passing gravitational wave which would have a known signature. 3. By mapping the hydrogen in a billion galaxies, the SKA will reveal the large-scale structure of the universe. This will allow us to study how galaxies form and evolve. Mapping the distribution of hydrogen across the cosmos will also shed light on the mystery of why the expansion of the universe is accelerating. Scientists detected this accelerated expansion in 1998 — a feat that won them the Nobel Prize in Physics in 2011 — and its cause is attributed to a mysterious and unknown “dark energy”. Understanding this dark energy is one of the SKA’s key science goals. 4. Another important area is the study of dark matter. Astronomers have been aware of dark matter for some time, and believe that it makes up most of the matter density in the universe, yet its direct detection remains elusive. The SKA will provide ways to map the dark matter distribution across the universe as well as provide ways to probe it a fundamental physics level. 5. We know that magnetic fields are ubiquitous in our universe and are present in planets, stars and galaxies not least our own earth and sun. Yet very little is known about their origin. The challenge in studying these magnetic fields is that while stars and galaxies can be seen because they emit light, magnetic fields can only be seen through their polarising effect on light. The SKA’s unique capabilities to detect polarised light will transform the study of magnetic fields and address topics such as the shape and strength of magnetic field in the Milky Way and how it compares to other galaxies. Perhaps the most important question the SKA will address is simply this: “Are we alone in the universe?” It will be able to probe the regions around stars where Earth-like planets are most likely to form and where the environments could potentially sustain life. Astrobiologists will be able to use the SKA to look for the building blocks of life — amino acids. We will be able to search much larger regions than ever before for signs of extraterrestrial life. The SKA’s extreme sensitivity makes it able to detect airport-strength radar signals on planets many tens of light years away. This means we could directly detect extraterrestrial signals, and perhaps one day listen to alien FM.